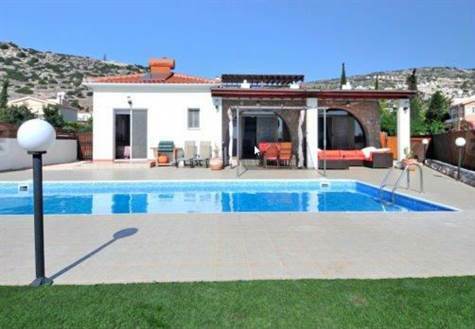 Peyia, Paphos - This 3 bedroom bungalow is located in the popular village of Peyia has a character of its own. All living areas are well spaced projecting an unhurried, comfortable and leisurely feel. Roomy interior, wide patio doors and windows flood the property with glorious sunlight and let you enjoy a brilliant outlook from every room. The villa is sited on a good sized plot surrounded by low maintenance garden culminating in a delightful and well screened entertainment area. The swimming pool is the focal point which boasts an interesting poolside setting as well as a brilliant roof garden with kitchen facilities, covered/uncovered terrace and the panoramic 360 scenery. The property is at the very end of a cul-de-sac with the covered parking for two cars to the left. From the parking area you enter an interesting alcove with expansive arches which show off the bright living room, looking straight ahead, and to the right, the bedrooms ‘wing’. You’ll love the meandering feel of the living area. A feature wall in the lounge has a gas fire, a welcome addition for the cold winter evenings! Surrounded by patio doors and windows you enjoy commanding views of the garden, pool area and the outdoor setting. The lounge flows seamlessly to a spacious sun room which opens to the pool covered terrace, whilst the dining area extends through an archway to a smart-wired office. On the other side of the living room there is a large and very stylish contemporary kitchen with solid granite worktops, granite inlaid splash-backs and convenient breakfast bar. The bedroom wing features a master bedroom which opens to the pool terrace and has an attractive en-suite shower room. The family bathroom is roomy and attractively detailed. The red marble inlaid vanity is particularly striking. All three bedrooms feature capacious built-in wardrobes. This is a fabulous character home that needs to be seen to be fully appreciated. The location is first class with an elevated southerly aspect. The home has title deeds available.